Lyssan Where flags change with the wind. Now at a Hobby Store Near You! Lyssan is now available in the U.S. & U.K., with Australian distribution on the way! Lyssan is done being printed and is heading our way from the factory now! The estimated arrival date I get from the shipper keeps wiggling between June 23rd and June 25th, so give or take a few days, this game should have wound its way to the Kickstarter backers and pre-orderers by early July, and into stores not long after. Haven't pre-ordered yet and want to? Lyssan is up on Kickstarter.com. "Glory, my lord? I would find glory in marching alongside you, hewing down my countrymen, and looting shoulder to shoulder with your sainted knights? Perhaps. Perhaps I would. But this old fort is the glory given to me. I have a charge to guard it still, and can abandon it at no cost. You have enemies beyond your rivals for the throne, my lord, whether you ken it or no. And it is my duty to the Empire of Lyssan to see that this fort stays guarded against them, for the day they will surely march again. May the gods smile upon you, my lord. Know that even as you march to war, you are watched over. The Eagle's Guard has a duty, and that duty shall never be betrayed." You will find them on the frontiers of the empire, manning the oldest fortresses. They watch over roads that no army has marched for a hundred years, yet they keep their swords as sharp as if war would break out the very next day. They have not fought for a generation, yet veterans of a dozen battles speak of them with respect. They are The Eagle's Guard. Each of the contenders have tried to gain their fealty. The Wolf offered them fame and glory. The Hawk plied them with riches and power. And what The Vulture offered them, none could say. Of all the contenders to visit The Eagle's Nest, he remained there the longest. 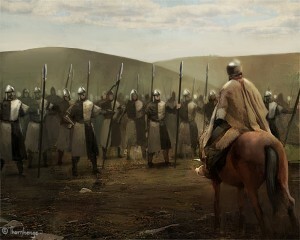 It is said that when he left that oldest fortress, that the general embraced him as a brother. Yet all the contenders rode away alone. None have found the key to make The Eagle's Guard abandon neutrality and march from their posts. The fate of Lyssan may be decided on the day they do. 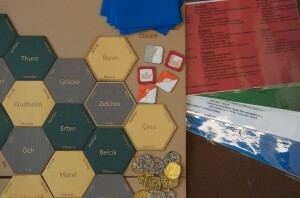 Had a major redesign of the board, along with numerous lesser rules tweaks. Picked up a graphic designer. Been mailed out in several beta-test kits, for testers in other cities to get a crack at it. The biggest lesson of the past month has been how a prototype made for alpha testing may be a death march to reproduce in volume for beta testing. The final alpha-test version of Lyssan was made with all laser-cut tiles and counters, hand colored counters and cards, a board glued together from 41 pieces, and 90 cards sleeved with the latest printout of their game text so they can be changed as needed. Building a copy of the alpha-test kit from scratch took days and a considerable volume of art & game supplies. Even after bringing in friends to help copy it for beta test kits, scaling from making one copy to making twenty of this version would take an army. So as we rush to make beta kits for distant playtesters, the methods change. Hand colored tiles are replaced by block printed ones. The next board may be silk screened instead of glued together. While the rules stay the same, most of the games props change. The upside of all this is that it's another step in the direction of making beautiful artisanal game sets possible. There's something beautiful about the thought of making a deluxe handcrafted copy of the game, long after it's being mass produced. One of the most gratifying things about making a game is seeing all the ideas that have been stuck in your head for weeks, months, or years make it out into the world. 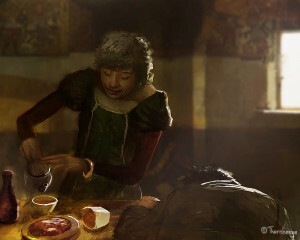 Seeing professional art - not just your imagination - makes the game suddenly real. For Lyssan, I have the honor of working with the exceptionally talented and creative Marek Madej. The world of Lyssan is one I've had in my head for years now, so the cards all have stories behind them. Many of them feature characters that I've already explored in other, unpublished games, who have never seen a wider audience before. The first challenge is to take all this and pack it down to a short description - one that hits the essential points, and gives Marek plenty of room to play. 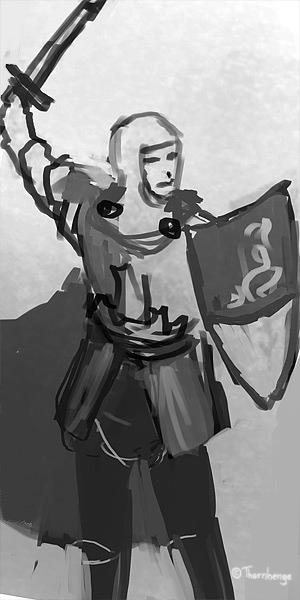 My image for the card: A crusader-knight wears armor covered in religious symbols. 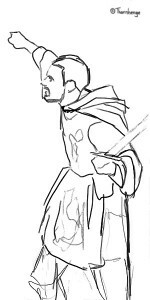 We see him at the moment of a hasty salute as he charges into battle. Notes: This is another vassal card - a card representing an alliance with a powerful faction in the game. The Brothers of Garus are a militant faction within the Church of Alor. 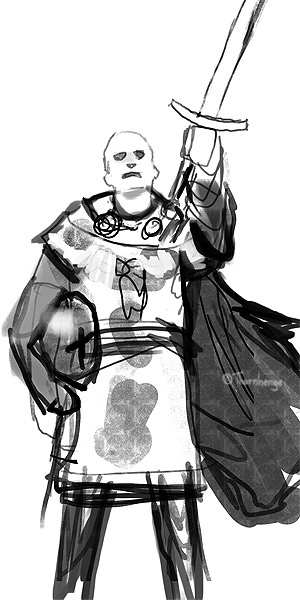 Their name is taken from Saint Garus, formerly named General Garus. According to legend, he was sainted after personally defeating the demonic general of an evil army that threatened to destroy the old empire. It is thought that the Brothers of Garus might be cast out of the church as heretics, if some orthodox priests of Alor gain power. It is said that they worship their saint above the creator, and would make all do so if they grew strong enough to try. Reminder: The church of Alor is inspired by the historical Catholic church, but they're fictional. They have their own symbols in place of the crucifix, fish, and so on. Feel free to invent a few of these symbols. 01 - The first one... is maybe not looking like hasty salute, but I just thinked that significant version can also looks nice. 02 -The second one is my favourite. 03- I didn't know... there wasn't any informations about horse in this one, but... I've done also version with a horse. 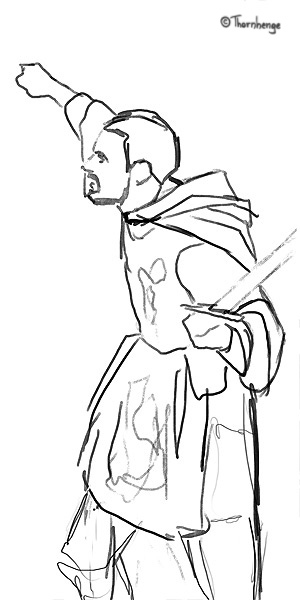 At this stage I'm looking over the thumbnails for a favorite, but I'm also looking for any problems. It could be something that would be an anachronism in the world, or something that doesn't fit the storyline, or something in the image that's going to take emphasis away from the part that should be the focus for the game. In this case, they all look good, and Marek has indicated he has a favorite. I'd be a fool not to let him chase his muse. He gets the go ahead to continue with that one. 9 is a version of General Garus' personal Coat of Arms, as seen on his shield when he was alive. It's been simplified over the years by the church to resemble the symbol of Alor - the three dots were originally heraldic devices like a 'lion rampant' or somesuch. The three lines are the dividing fields of the shield, where it was originally split into three fields. In the 200 years since Garus' death, the story of Saint Garus has grown, so now a visitor to the church is more likely to hear that the central T represents Garus himself and the three dots are his loyal Corporals, or some other corruption of the original meaning of the symbol that makes it seem more grand. And it's not long after that when Marek finishes the final version of the image. ...and that's where the images come from. Cool, huh? "You're visiting to see my gardens! My heavens, young man. You're a naughty one. You're here to talk with General von Bremer, of course. You'll be wanting to convince him that he'd be better off taking the coin of that horrid pretender you serve. You thought I wouldn't know? But I'm boring you. You're fast asleep. Just like my third husband, Lord Meched. He nodded off during tea as well. Duke Bjarrnae, my seventh husband, he was the same way. Or was he my ninth? Oh, where has my memory gone? It must be all the arsenic. Or was it the belladonna?" Two types of agents serve you in your struggle to unite Lyssan: Armies and infiltrators. Knights and nobles command armies. They fight each other, control territory, and keep the local gentry paying their taxes to the one true Emperor of Lyssan. That would be you. Spies and priests are infiltrators. They do their work in territory your rivals control. Armies can't harm infiltrators and infiltrators can't hurt armies. Unless you have the right surprise ready. Old Age and Treachery lets a noble bump off a spy or priest. It's an archetypical surprise card. Spies and priests glide past bumbling nobles day in and day out, until one day they step into the court of a lord who knows a bit more than they let on. 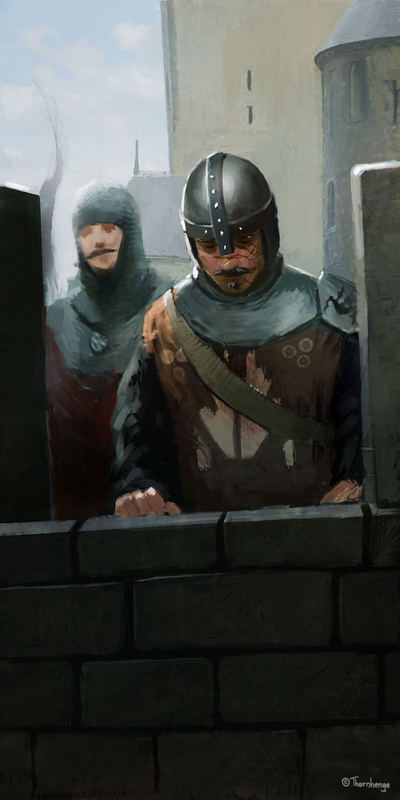 A nosy spy or an older brother in line for the throne. Either can be invited out to hunting party that ends in tragedy. A relative who entered the priesthood to sidestep the family politics, or one who's tampering in affairs for a distant lord's sake. Either could expire after a brief but convincing illness, with the help of a sympathetic apothecary. And the advantage of sitting on the throne is that no one asks the inconvenient questions afterwards. 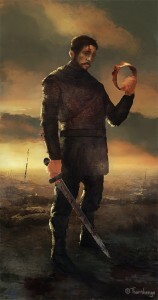 "Battles leave empty thrones, my son. Your grandfather, Karl vor Hornberg, was a commoner, and a sell-sword, with only two men under his command: His brothers. By the Battle of Witges he commanded a platoon, and the Duke awarded him the now-vacant knighthood of the recently deceased traitor family von Kleist. By the time I took over the company, we had three battalions and a barony. 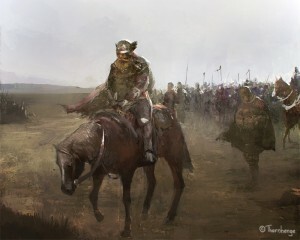 For my support in the Battle of Keldbrukke, His Majesty, King Jerger awarded me the recently vacated Duchy of Beidebaum. You now take command of the greatest army west of the Neiße river. See to it that your son is called King." - Kristof von Hornberg to his son, Ulrich von Hornberg, on the occasion of his 18th birthday. Recruiting vassals is one of the keys to winning Lyssan. A vassal is an influence card representing an alliance with a powerful faction within the Empire. The von Hornbergs are one of these: a noble family that built their power a gallon of blood at a time, working their way up through the gentry by fighting in every major battle and having a knack for choosing the winning side. Vassals give a player an immediate influx of units, and the ability to hire more agents of a type than they would normally be allowed. 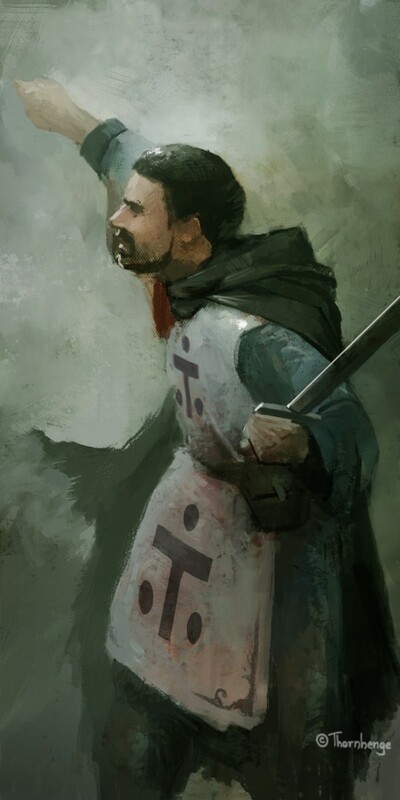 In a game were the final victory point can come from fielding the most knights or priests or spies, this can make the difference between winning and losing! Only one can't depend on vassals. The alliance with the vassal is a 'holding', and holdings can be stolen by enemy spies, given the chance. When a vassal card moves from one player to another, the agents from the vassal also swap sides! Hi. I'm Sam. I've been working on a wargame, named Lyssan, for the past 6 months - since July, 2010. I'd designed boardgames before, but I knew this one was different from very early. Something about the way all the parts fit together made something magical and new. I'd first set out to design a competitive game of crisis management: Something like Matt Leacock's "Pandemic", but with the players struggling for top ranking amidst the crisis, offing each other's agents, and risking bringing the world down around their ears. 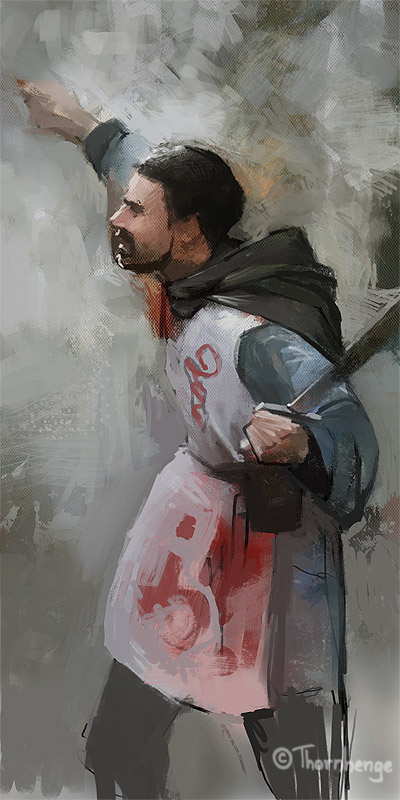 I set the game in a warring, feudal world, where the competing lords would be happy to take advantage of chaos to get the upper hand on their rivals. By the time the game was ready to have the crises added in, the diplomacy and strategy of the struggle was already rich enough to be its own game. The original idea for the game is now the first expansion. It took a week to get the first draft of the rules down. The rest of the month before I had a prototype assembled. This isn't a small game - the first version had more than 200 units, 37 map tiles, a deck of 90 cards, plus coins, recruit tokens, and other odds and ends. In spite of that, from the first playtest, we were wrapping games up in two or three hours each, and people really liked it. And it could have continued on this way for much longer, a few playtests at a time. For years before, I'd been bookmarking the portfolios of online artists whenever I'd found one I liked. While playtesting Lyssan, it was natural to go through that list and pick the ones who drew most like the images of this world I had in my head. And then a few days ago, I wrote to one of my favorites, and asked if he was available to freelance on the project. He said yes. That was eight days ago. In the meantime, a company has been formed to publish Lyssan. The contact went off to our mystery artist. And this site was put up. Welcome to it. Stick around. 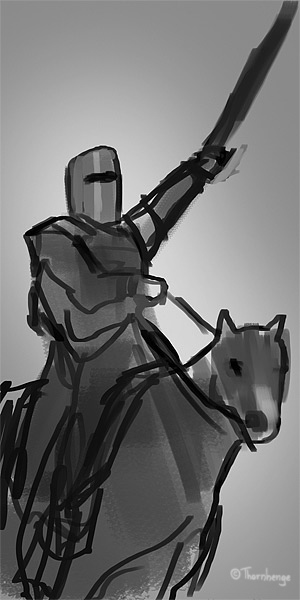 In a few more weeks, our mystery artist (along with his first few sketches) will appear, and there will be sneak peeks of the game.